Campaign & Event Awards looks at how XYZ’s work on Nike Strike Night, as part of the launch of the Hypervenom 3 football boot, won the Integrated Marketing category in this year’s Event Awards. Nike’s debut Strike Night was an audacious live experience featuring Europe’s top six elite football goal-scorers going head-to-head in the ultimate penalty shoot-out, combined with a one-hour Facebook Live show. 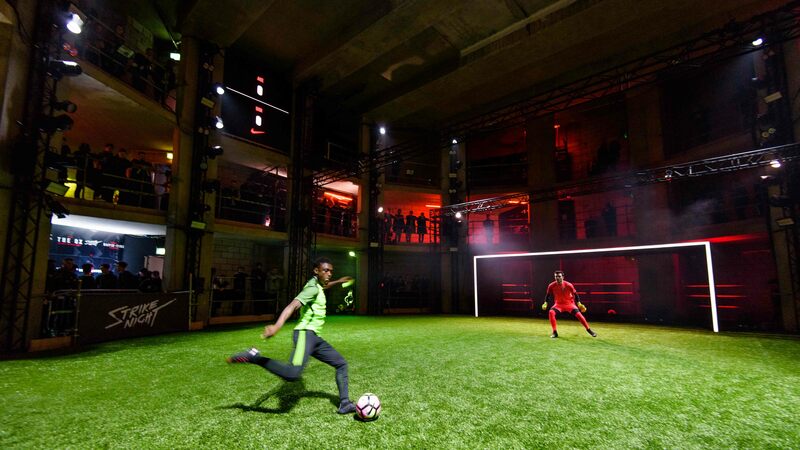 Dubbed “Fight Club for football” by lead agency XYZ, which designed and built the set as well as running the event on the night, Strike Night was intended to transform the launch of the Nike Hypervenom 3 boot into a cultural moment while creating the highest level of digital engagement among target audiences including football-obsessed teens. Inspired by the NBA dunk contest, XYZ created Strike Night in a secret underground London location, welcoming 400 invited guests to be a live audience there, alongside almost half a million live viewers via Facebook Live.